Whether we are making a one-of-a-kind tool, or machining a short run job, attention to detail is paramount. It’s not uncommon for us to catch customer engineering errors before any machining is done, thereby avoiding costly rework and delays. Our Quality Control Manual complies with Mil-I-45208A. The measuring instruments that we use are calibrated regularly, and our strict quality control procedures ensure the accuracy and quality of every project. 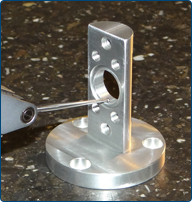 At MASON MACHINE & TOOL, we are constantly striving to achieve zero defect manufacturing. Our attitude is that shipping parts that are “out of print” is simply not an option. If you need tooling, prototypes or short run machined parts, send us a Request For Quote. Let us demonstrate our work ethic and impress you with our standards of quality.